"We're not in Windsor often, but when we are we always make sure to come here in the mornings for their cooked breakfast"
2 eggs, sausage, 2 bacon, mushrooms, tomato, hash brown, beans, 2 toast, tea or coffee and orange juice. 2 eggs, sausage, bacon, hash brown, beans, toast and tea or coffee. 2 eggs, mushrooms, hash brown, vegetarian sausage, tomato, beans, toast and tea or coffee. 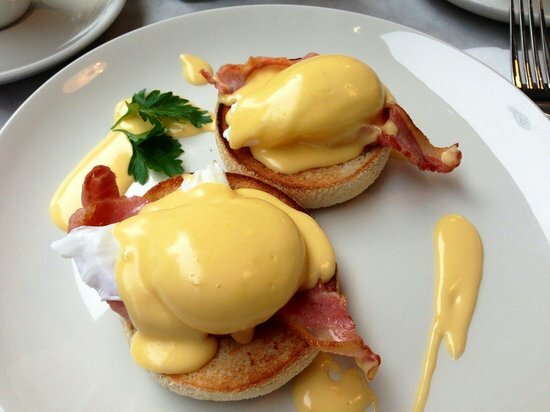 Poached eggs on toasted muffins with ham and hollandaise sauce. Toasted Bagel served wth smoked salmon and cream cheese. Choice of egg, sausage, mushroom or bacon. Freshly made pancakes served with maple syrup.